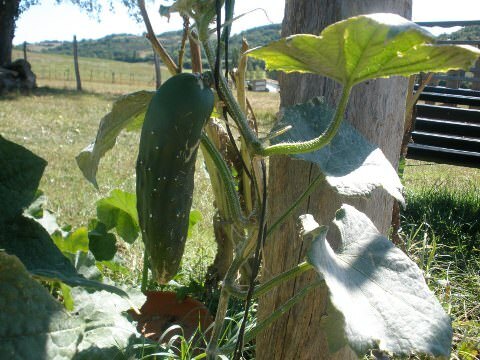 The Cucumber is a creeping vine and it grows very well on trellises. Joerg plants them everywhere so I have some growing in between the roses and the Wisteria. Picking them from the rosebush has been put onto said husband’s To-Do List. They have an enclosed seed and develop from a flower, so scientifically they are classified as a fruit, just like tomatoes. Which reminds me of a beautiful quote I read recently. I don’t know who said this, so please feel free to email me if you know who it is. …I am at a loss for words. How often have you gotten up in the morning and said, “Ooh, today I think I’ll attach a knife to the front of my car and chop up the cucumbers for the evening salad.” Less times than this Japanese man, I would think. Not that it’s not impressive to see a cucumber on top of a stand with a camera man in a very precarious spot right next to it and a (crazy) man bearing down on it and chopping it in half with his car. In a drift maneuver. What is also quite interesting is that there appears to be a microphone pointed at the cucumber. I don’t understand Japanese, so maybe all that talk was the cucumber going, “NO! NO! I don’t want to die!” And then there was silence. Let’s have a moment for that cucumber, shall we? I was telling friends about the wonderful Japanese Cucumber Chopper and Mushleigh said that was nothing compared to the Japanese square watermelon and their binoculared football team. What are you talking about woman, you may ask. The Jap’s have come up with square watermelons – they grow them in square (you guessed) boxes so that they are easier to slice. How come I didn’t think of that? Then he topped the square watermelons with another edition of the (in)famous “World’s Records” show and we screeched with laughter as 10 men with binoculars strapped to their faces tried to kick a football. Although this may seem easy, according to this video, it is not. They kept walking towards the ball and then completely missing it! To add insult to injury, they were also wearing striped “jailhouse” pyjamas. The mid boggles. So once again I have lost track of what I was originally talking about, the cucumber. 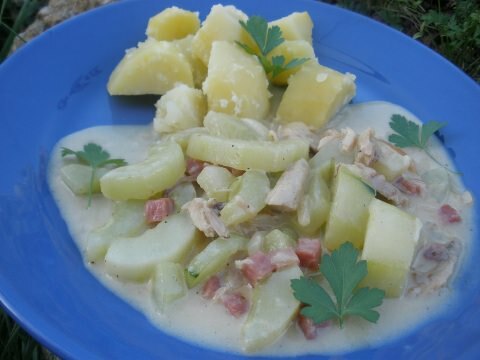 And so it is once again time for today’s (very painless, non-square) recipe: cucumber chicken fricassee. You may not be familiar with cucumber being served warm rather than just in a salad, but do give it a try as you will be very surprised at how good they taste cooked. 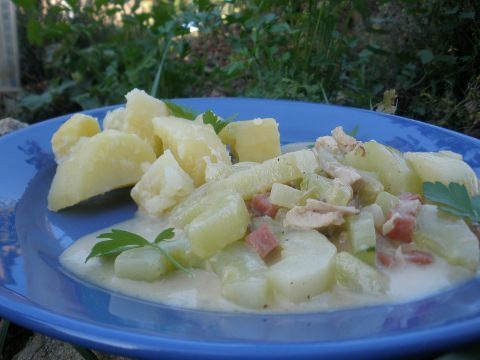 I found a version of this recipe in South Africa years ago and find it to be a great way to make use of an over-abundance of cucumbers and it tastes great. The original version uses chicken breasts, but I prefer to use thigh pieces which I cook before hand, allow to cool slightly, then remove from the bone and add to the dish at the end. As I have mentioned before, we get lardons in France, which is just French for bacon bits. I also sometimes use ham cubes (also available pre-packaged in France) in place of the bacon (I used them in the meal featured in the photo). You can use more chicken stock depending on how saucy you like your meal. 1. Sauté the onions and garlic in the oil for a few minutes and then add the bacon and sauté a few more minutes. Add the chicken and continue to sauté until it is almost cooked. 2. Add the stock and boil for a couple of minutes. Add the cream and cucumbers and simmer for no more than 5 minutes (you want to cucumbers to still have some “bite” to them). Do not allow to boil as the cream could separate and this looks unattractive. 3. Season and thicken if desired. Serve with either potatoes or rice. Enjoy! !